Being the first dedicated Halo game on the Xbox One there's a lot riding on Halo 5's shoulders, especially considering the PS4 lacks triple-A exclusives in the build-up to Christmas. Rise of the Tomb Raider and Forza Motorsport 6 aside, Halo 5 Guardians is the game that will garner most scrutiny by critics and consumers alike when it comes to choosing which console should be on wishlists this holiday season. Thankfully it wears that pressure like Spartan armour. Halo 5's campaign mode might be a tad short for skilled players (around 10 hours) and there might be a few tips of the hat to Destiny here and there, but 343 Industries has provided proof positive that the Halo series is in safe hands going forward. It's not the first Halo game developed by the studio, of course. 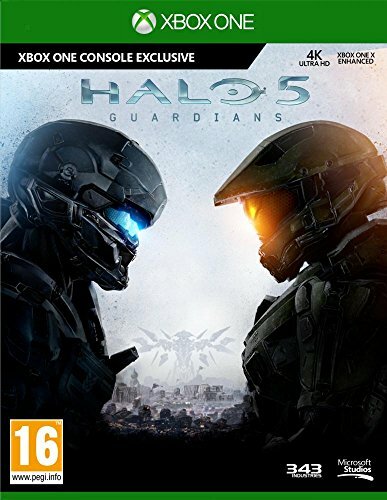 That honour goes to Halo 4, with remasters and mobile games filling in gaps, but Guardians is the first developed specifically for the Xbox One and that distances this chapter from Bungie's original trilogy by an entire technical generation. Certainly, the developer has stamped plenty of its own marks on Halo 5: Guardians to leave you in no doubt who's now in charge, but it does so while respecting the vast community of fans that has elevated the franchise to superstardom over the years. Its multiplayer is arguably more fun than Halo 4 – harking back to Bungie years with one or two new twists – but it is the campaign mode that has been fiddled with most, thanks to mandatory co-operative play. While Halo 4 had the option to play its campaign with three friends by your side, in Halo 5 that is a constant. You will always be accompanied by three other Spartans, even if playing solo. That's because the storyline in campaign is geared around two teams of four Spartans, who chase each other around the universe on wide-reaching missions. Blue Team is headed by Master Chief, who is contacted by an old friend while on a seemingly routine operation. It prompts him and three other Spartans – Linda, Kelly and Frederic – to go AWOL, much to the United Nations Space Command's dismay. The organisation therefore sends Fireteam Osiris, led by Jameson Locke (from the Halo: Nightfall digital TV series), to hunt and capture their counterparts "by any means necessary", cueing a campaign mode that switches between teams and characters as it progresses. While that provides less action while wearing Master Chief's boots than some might like, Fireteam Osiris is actually the more interesting of the two. There's far more interaction between the ancillary characters, with former ODST member Edward Buck (once again played by Firefly's Nathan Fillion) and fellow Spartans Olympia Vale and Holly Tanaka sharing background and banter throughout. This not only serves as a welcome distraction to the heavy firefights dotted throughout missions, but also as character-building. The Chief's team is less verbal so ends up less three-dimensional, we feel. That doesn't affect how they operate though, with all AI Spartans pretty much working in a similar way to each other and effectively providing combat support. You can guide them around and give contextual orders – all through the press of the up arrow on the d-pad – depending on what you are looking toward at the time. For example, when facing a vehicle, it will tell the other Spartans to climb on-board, but when facing an enemy, it will command them to attack it. Apart from that, they can revive you and each other if any of you have fallen in combat and they make a good attempt at emulating what a real player might do in a skirmish. The time the AI doesn't work so well is when you are faced with a harder enemy or boss. The latter, for example, require better tactics that running headlong into the fight and taking them head-on, and when playing with computer chums you end up having to take them down almost single-handed. It's not impossible but harder when you don't have genuinely human beings taking strategic positions. That said, like Forza Motorsport 6 and its Drivatars, the AI control is still better than you will have experienced in other games and does make the campaign more fun to play through on your own than most. It's obviously better when you have some like-minded souls accompanying you throughout the missions, but those who prefer their own company won't miss out on much. Indeed, as we've illustrated, it might even make for a greater challenge. Co-op, along with multiplayer, uses Microsoft's dedicated cloud servers to operate rather than a peer-to-peer system and that makes a big difference to stability during play in all modes. It has also allowed 343 Industries to introduce Warzone, a quite incredible new multiplayer mode that is on a par with Star Wars Battlefront in the online excitement stakes. Warzone battles are played on enormous maps and can take up to 24 players at a time – two teams of 12. It also throws in bases to seize and hold, Covenant and Promethean forces to dispatch, vehicles and other AI troops. All of these things earn various quantities of points, depending on what you do with them, and thanks to the sheer chaos undertaken in each round, differently skilled players can find different things to do that suit their style of play best. That doesn't mean Halo 5 doesn't also offer the multiplayer modes of yesteryear to keep us all happy too. Under the Arena banner you can take place in Team Arena, Breakout, Free-For-All, Slayer and the super-hard Swat mode where you get no shields and no motion tracker. There's also a ranking system and the ability to sport different armour and helmet types, including changing the colour or skin of almost everything. You don't get weapon loadout choices as such this time around. Instead, you'll start with the same basic weapons each time you spawn and must hunt down the game's best devices of destruction. This balances multiplayer somewhat and is much welcome round these parts. It's also indicative of the game as a whole. There are some real standout changes that feel right and plenty of tweaks to make things work more like the Halo games we loved back in the day rather than the newer Halo 4. The campaign mode feels epic, with the cat-and-mouse chase between Locke and Master Chief providing plenty of variety throughout. It could do with being longer, especially as it's not as tough as previous campaigns thanks to the revive mechanic, but Halo has always been a game of two halves and the multiplayer has always been a significant selling point. Graphically, 343 Industries has done a spectacular job. Its previous 60 frames per second upgrade of the former Halos in The Master Chief Collection was impressive, but actually utilising the Xbox One's graphical muscle has presented a stunning looking game that runs as smoothly as it is crisp. It's not always run at 1080p thanks to maintaining the frame rate, but you'd barely notice. The game is well worthy of its current-generation billing. Having been first teased in the summer of 2013, Halo 5: Guardians has been a long time coming, but its arrival could not have been better timed. This Christmas is arguably Sony's weakest in terms of exclusive PS4 titles, while Microsoft has plenty to shout about with this, Rise of the Tomb Raider and Forza 6. Halo 5 was always going to appeal directly to existing fans who want to continue Master Chief's journey, but 343 Industries has created a game this time that could win an all-new audience too. It has plenty of gameplay tweaks that make it more accessible to gamers who might not have jumped on board the Halo bandwagon before. And newbies will love the revive system which will help them progress without having to restart at checkpoints too often. Graphically it is superb, running at 60fps and looking super smooth. And you never really notice the dynamic drops in resolution during the more mental combat sequences because, well, you'll be more concerned with the mental combat. The first Halo was sub-titled Combat Evolved, so with that in mind we guess you could consider Halo 5: Guardians as Combat Evolved, evolved. Even though it might not be the game that everyone was expecting, we think it's super stuff.